Ayodhya, an ancient Indian city, is one of the seven sacred cities of the Hindus. The Ayodhya of Ram is believed to have existed in the Treta yuga of the Hindu calendar, i.e. some 900,000 years ago. Though a thinly-populated town now, Ayodhya ranked amongst the six most important Indian cities in the 6th century b.c. Sacred to the Hindus because it was Rama’s birthplace, it continues to hog the limelightfor the same reason.On the right bank of the river Ghaghra or Saryu, as it is called within sacred precincts, stands the holy city of Ayodhya, believed to be the birth place of Lord Rama, the seventh incarnation of Lord Vishnu. 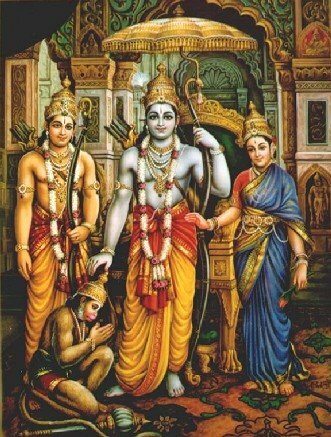 The ancient city of Ayodhya, according to the Ramayana, was founded by Manu, the law-giver of the Hindus. For centuries it was the capital of the decendants of the Surya Vansh of which Lord Rama was the most celebrated king. According to traditional history, region around Ayodhya during ancient times was known as Kosaldesha, the kingdom of Kosala Ayodhya was the capital of the Kingdom of Kosala. Kosala was one of the sixteen great Janpadas (great nations) that ruled the area from the Kabul valley to the banks of the Godavari on the eve of the rise of Buddhism in the 6 th century b.c.Prasenajit was the ruler of the kingdom at that time. Later the Kosala kingdom was swallowed up by the powerful kingdom of Magadha which corresponds to the districts of Patna and Gaya in Southern Bihar. The Atharvaveda describes Ayodhya as "a city built by gods and being as prosperous as paradise itself". The illustrious ruling dynasty of this region were the lkshvakus of the Surya Vash. Accoridng to tradition lkshvaku was the eldest son of Vaivasvata Manu, who established himself at Ayodhya. The earth is said to have derived its name 'Prithvi' from Prithu, the 6th king of the line. A few generations later came Masndhatri, in whose line the 31st king was Harishchandra, known idely for him live for truith. Raja Sagar of the same clan performed the ashvamedha yajna and his great grandson bhagirath is reputed to have brought ganga on earth by virtue of his penances. later in the time came the great raghu after whome the family came to be called as raghu vansh . His grandson was Raja Dasharatha the illustrious father of lord rama with whome the glory of the dynasty reached its zenith. According to pauranic belief in the 93rd generation from Ikshvaku the 30th from lord rama was vrihadbala the last famous king of the ikshvaku dynasty of ayodhya who was killed during the Mahabharata war. 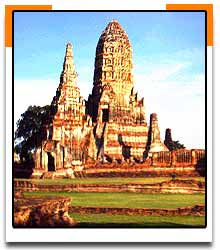 The kingdom of kosala again rose to prominence in the time of the Buddha, i.e. 6th century B.C. however Ayodhya was displaced as the capital city. Scholars agree that Ayodhya was identical with Saketa, where Buddha is said to have resided for some time. Ayodhya is pri-eminently a city of temples. At Ayodhya several religions have grown and prospered simultaneously and also at different periods of time in the past. Remnants of Hinduism, Budhism , Jainism, Sikhism can still be found in Ayodhya. According to Jain tradition, Ayodhya was the seat of five Tirthankaras, including the first Tirthankar Adinath (Rishabhadeva). In the Ramayana, Lord Rama was born here during the reign of his father, Dasaratha, in what was then a prosperous, well fortified city with a large population.Then it was called as Saket which muslim Invaders converted into Faizabad which is district now.In this district town of Ayodhya lies which is 6 km away from district centre. In traditional history, it was the early capital of the kingdom of Kosala, while, in Buddha's time (6th-5th century BCE), Shravasti became the kingdom's chief city. Scholars equate Ayodhya with the city of Saketa, where the Buddha is said to have briefly lived. Its later importance as a Buddhist centre was attested by the Chinese Buddhist monk Fa-hsien in the 5th century CE who saw 100 monasteries here. Other monuments, including a stupa (shrine), were apparently built by Ashoka in the 3rd century BCE. The Kanauj kingdom arose here in the 11-12th centuries. Later part of the Delhi sultanate, the Jaunpur kingdom, and the Mughal Empire, Oudh gained a degree of independence in early 18th century, before its subordination to the British East India Company in 1764 and annexation by the British in 1856; this and the subsequent loss of hereditary land revenue rights helped precipitate the Indian Mutiny of 1857. Despite the city's great age, few ancient monuments survive. Its temples and bathing ghats by the river Saryu are of no great age. Near the modern city are several mounds marking the site of ancient Ayodhya that have not yet been adequately explored by archaeologists. Ayodhya is considered to be a holy place by many faiths. It is the birthplace of Shri Ram for the Hindus,Muslims believe that it is in the cemetery by the Saryu river in Ayodhya where Shea, the grandson of Adam, is buried.then there are Jain tirthsnkaras and sikh holy gurudwara in memory ogf Nanak`s vist to ShriRama`s city. The exact location of Ayodhya is yet another controversy.Archaeological excavations at Ayodhya which is on the right bank of the Saryu river in Faizabad district of Uttar Pradesh reveal that "the earliest settlement at Ayodhya did not go back prior to the early stage of the Northern Black Polished Ware (NBPW) Culture" which could be assigned to circa 700 BCE. Thus if Ramayana episode was historical, it could not have taken place earlier. (10) Based on Valmiki's Ramayana and a few other sources, Sher Singh contends that if Valmiki's description of Ayodhya is correct, it must be some 13 to 14 miles south of the river Saryu in Nepal. (11) The traditional lack of interest in cartography in India is not helpful to solve this riddle in any way. Ayodhya is 'rediscovered' by 'Vikramaditya,' who is identified by many scholars as Skandagupta of mid-5th century CE, when Buddhism began to decline as a result of a Brahmanical resurgence. (5) While Romila Thapar maintains "Chandra Gupta II took the title of Vikramaditya or Sun of Prowess,"(6) Sher Singh ascertains that the claim that Skandagupta shifted his capital to Saketa (Ayodhya) is baseless. No matter how contentious the historicity of Ayodhya is, it is nonetheless one of the seven holy places of 'Hindus' because of its association with Ram. Of the 6,000 Hindu shrines in Ayodhya, more than 4,000 are connected with Ram. This religious importance coupled with contemporary political significance leads the Hindu to conclude: Ayodhya is the centre of our Hindu nationhood, and Lord Rama our national leader. Without Ayodhya, this nation cannot be a nation in the fullest sense of the word, just as there can be no Christendom, which is what Europe is, without the Vatican.In 1990,Hindus in northern India marched toward ayodhya with intent on erecting a temple by community work called KARSEWA on the site; the ensuing crisis brought down the Indian government. Two years later, on 6 Dec 1992, the three-story complex where both hindus and muslims were praying before was replaced by a makeshift Temple.Thus in history Ayodhya united hindus and revived Hindu religion first against Buddhism and now against Islamic threat. Ram Janmabhoomi (राम जन्मभूमि) prior to 1528, a temple stood at this site and that in 1528 the temple was demolished on the orders of Mughal invader Babur and a mosque was built on its ruins. This mosque came to be known as the Babri Masjid. References such as the 1986 edition of the Encyclopædia Britannica reported that "Rama’s birthplace is marked by a mosque, erected by the Moghul emperor Babar in 1528 on the site of an earlier temple". According to the Hindu view, the ancient temple could have been destroyed on the orders of Mughal emperor Babur. However the others don’t agree, in his slim yet insightful booklet, Communal History and Rama's Ayodhya, Professor Ram Sharan Sharma writes, "Ayodhya seems to have emerged as a place of religious pilgrimage in medieval times. Although chapter 85 of the Vishnu Smriti lists as many as fifty-two places of pilgrimage, including towns, lakes, rivers, mountains, etc., it does not include Ayodhya in this list." Sharma also notes that Tulsidas, who wrote the Ramcharitmanas in 1574 at Ayodhya, does not mention it as a place of pilgrimage.Colonial British records maintain that efforts to replace the mosque with a temple had been on since before independence in 1947, but had been continually stymied by both the central government and various Indian courts. 2. In 1528, the Babri Masjid is constructed on the orders of the Mughal leader Babur post destruction of existing ram mandir. 3. In 1949, icons of Lord Ram appeared in the Babri Masjid. The semi-governmental Wakf Board, an Indian Muslim trust owned the land on which the mosque stood. Both Hindu and Muslim parties launch civil suits and the Indian government, declaring the site "disputed", locks the gates to the mosque. 4. In 1984, a movement is started for the creation of Ram Janmabhoomi temple by the Vishwa Hindu Parishad (VHP) and Bharatiya Janata Party, under the leadership of L K Advani. 5. In 1986, a district judge of Uttar Pradesh, orders the opening of the disputed structure to Hindus. In 1989- 1990, the VHP intensifies its activities by laying foundations of the Ram temple on the adjacent property. Prime Minister Chandra Shekhar proposes negotiations which only intensify the crisis. 6. In 1992, on December 6, the Structure is forcibly demolished by Kar Sevaks.The then Narasimha Rao led Congress government let a makeshift temple appear in its place before moving the courts for status quo. ]The demolition of the mosque triggered large-scale rioting. 7. In 2005 Kashmiri terrorists attacked the Ram Mandir and were gunned down by security forces. "Emperor Aurangzeb got demolished the fortress called Ramkot, and erected on the same place a Mahometan temple with three cuppolas. Others believe that it was constructed by Babar. We see 14 columns of black stone 5 spans high that occupy places within the fortress. Twelve of these columns now bear the interior arcades of the Masjid; two (of the 12) make up the entrance of the cloister. Two others form part of the tomb of a certain Moor. It is related that these columns, or rather the debris of these columns, were brought from Lanka (called Ceylon by the Europeans) by Hanuman, chief of the monkeys." ... Plus tard Aurungzeb, ou, selon certains, Babar, détruisit l'endroit afin d'empêcher des païens de pratiquer leurs cérémonies. Toutefois ils continuèrent à pratiquer leurs cérémonies religieuses dans ce lieu, le connaisant comme celui de la naissance de Rama, en en faisant 3 fois le tour et en se prosternant à terre..
We see on the left a square platform 5 inches above ground, 5 inches long and 4 inches wide, constructed of mud and covered with lime. The Hindus call it bedi, that is to say, the birth-place. The reason is that here there was a house in which Beschan, (Bishan-Vishnu) took the form of Rama, and his three brothers are also said to have been born. Subsequently, Aurangzeb, or according to others, Babar razed this place down, in order not to give the Gentiles (Hindus) occasion to practice their superstition. However, they continued to follow their superstitious practices in both places, believing it to be the birthplace of Rama." Questions of history This record reveals that Aurengzeb demolished the Ramkot fortress; that either he, or Babar constructed a Masjid there; the 12 columns of black stone pillars were brought from Lanka; and when veneration of Rama became prevalent after the 17th century, a small rectangular mud platform was built to mark the birthplace of Rama.However, this account does not explicitly mention the existence of a temple but a mud platform. Mizra Jan also wrote: ‘wherever they found magnificent temples of the Hindus ever since the establishment of Sayyid Salar Mas’ud Ghazi’s rule, the Muslim rulers in India built mosques, monasteries, and inns, appointed mu’azzins, teachers, and store-stewards, spread Islam vigorously, and vanquished the Kafirs. Likewise, they cleared up Faizabad and Avadh, too, from the filth of reprobation (infidelity), because it was a great centre of worship and capital of Rama’s father. Where there stood the great temple (of Ramjanmasthan), there they built a big mosque, and, where there was a small mandap (pavilion), there they erected a camp mosque (masjid-i mukhtasar-i qanati). The Janmasthan temple is the principal place of Rama’s incarnation, adjacent to which is the Sita ki Rasoi. Hence, what a lofty mosque was built there by king Babar in 923 A. H. (1528 A.D.), under the patronage of Musa Ashiqan! The mosque is still known far and wide as the Sita ki Rasoi mosque. And that temple is extant by its side (aur pahlu mein wah dair baqi hai) ’ (Mirza Jan: Hadiqa-i Shahada (“The garden of martyrdom”), Lucknow 1856p. 247). Mirza Jan also wrote (quoting a relative of Aurangzeb), that the temples of Rama, Shiva, Krishna as well as Sita's Kitchen (i.e. part of the Ramkot complex) "were all demolished for the strength of Islam, and at all these places mosques have been constructed". But there are others who contest the writing as an exaggerated version of history in a book that is on Martyrdom and published at least three hundred years later to the construction of the Babri Mosque. Shykh Muhammad Azamat Ali Kakorawi Nami (1811-1893) wrote: ‘According to old records, it has been a rule with the Muslim rulers from the first to build mosques, monasteries, and inns, spread Islam, and put (a stop to) non-Islamic practices, wherever they found prominence (of kufr). Accordingly, even as they cleared up Mathura, Bindraban, etc., from the rubbish of non-Islamic practices, the Babari mosque was built up in 923 A.H. under the patronage of Sayyid Musa Ashiqan in the Janmasthan temple (butkhane Janmasthan mein) in Faizabad-Avadh, which was a great place of (worship) and capital of Rama’s father’ (p. 9). ‘Among the Hindus it was known as Sita ki Rasoi’.Zak Kakorawi, in his publication of the work of Shykh Azamat Ali Kakorawi Nami, also includes an excerpt written by Mirza Rajab Ali Beg Surur. Mirza Rajab Ali Beg Surur (1787-1867) wrote in Fasanah-i Ibrat that ‘a great mosque was built on the spot where Sita ki Rasoi is situated. During the regime of Babar, the Hindus had no guts to be a match for the Muslims. The mosque was built in 923 A.H. under the patronage of Sayyid Mir Ashiqan… Aurangzeb built a mosque on the Hanuman Garhi… The Bairagis effaced the mosque and erected a temple in its place. Then idols began to be worshipped openly in the Babari mosque where the Sita ki Rasoi is situated,’. In Abul Fazl’s Ain-i-Akbari (1598), Ayodhya is called “one of the holiest places of antiquity” and “the residence of Ramchander”. It mentions the celebration of Rama's birth festival (Ram Navmi) in Ayodhya. However, again no specific spot was identified, in this account. He even mentions small details such as two Jewish priests lay buried in Ayodhya. Yet there is not the remotest reference to Ram's birthsite, let alone to any mosque built on it. Clearly the tradition did not continue Ram's birthplace to the existing town of Ayodhya, or the site occupied by the Babri Masjid. "Mir Khan built a masjid in A.H. 930 during the reign of Babar, which still bears his name. This old temple must have been a fine one, for many of its columns have been utilized by the Musalmans in the construction of Babar's Masjid." "It is said that up to that time, the Hindus and Mohamedans alike used to worship in the mosquetemple. Since the British rule a railing has been put up to prevent dispute, within which, in the mosque the Mohamedans pray, while outside the fence the Hindus have raised a platform on which they make their offerings." This platform was outside the disputed structure but within its precincts. Hindu protagonists say that they have been demanding the return of the site for centuries, and cite accounts from several western travellers to India during the Mughal rule in India. the Janmasthan temple "was destroyed by Babar and replaced by a mosque." He also wrote "The Janmasthan was in Ramkot and marked the birthplace of Rama. In 1528 A.D. Babar came to Ayodhya and halted here for a week. He destroyed the ancient temple and on its site built a mosque, still known as Babar's mosque. The materials of the old structure [i.e., the temple] were largely employed, and many of the columns were in good preservation." William Flinch, AD 1608,the British historian William Flinch who stayed in India during AD 1608-11 gives a detailed description of Ayodhya and the castle of Ramchand (Ramkot), "extensive enough to undertake a search for gold." Though he does not mention the birthplace of Rama, he gives a detailed account of the place where the ashes of Ram are kept. "Some two miles on the further side of the river in a cave of his with a narrow entrance, but so spacious and full of turnings within that a man may well loose himself there if he taketh not better heed; where it is thought his ashes were buried. Hither resort many from all parts of India, which carry from thence in remembrance certain grains of rice as black as gunpowder which they say have been preserved ever since." Had the place been considered sacred for being the birthplace of the Lord Rama, it should have become one of the places of pilgrimage. Instead the place where his ashes are kept was considered a place of veneration. "If we do not take Hindu mythology in account the first historical description of the city dates back recently to the 7th century, when the Chinese pilgrim Xuan Zang observed there were 20 Buddhist temples with 3000 monks at Ayodhya, amongst a large Hindu population". further she says "In 1528, nobles under Mughal emperor Babur constructed a mosque over the disputed site. The mosque, called the Babri Masjid, has become a source of contention for some Hindus. At the end of the 19th century, Ayodhya contained 96 Hindu temples and 36 Muslim mosques. Little local trade was carried on, but the great Hindu fair of Ram Navami held every year was attended by about 500,000 people.". The 'Muslim conquest' sets the next and most important stage in the controversy. Emperor Babar's general, Mir Baqi, has destroyed a Ram temple and built the Babri Masjid on the same spot around 1528 CE. If there really existed a temple before the mosque was built is the core of the controversy now. B. B. Lal who initiated and headed an archaeological survey of Ayodhya since 1975 made a claim in the RSS magazine Manthan in October 1990 to having found the pillar-bases of what may have been a temple at the site.The famous poet Tulsidas, who sang the glory of his beloved Ram during the early part of the 17th century, kept silent on this issue. In the 18th century, Ayodhya once again became a major center of Hindu pilgrimage under the patronage of the Nawabs of Avadh, Shuja-ud-daulah and Asaf-ud-daulah. Hindu revivalism which took root in Avadh consolidated its position after the British takeover of Ayodhya. At this time the Nirmohis, a Hindu sect who had their establishment at Ram Ghat and Guptar Ghat, lay their claim over the Babri Masjid. They contended that the mosque stood on the spot of the Ramjanma bhoomi temple which was destroyed by Babar. These claims led to the violent conflict of 1853-55.In May 1883 the Deputy Commissioner of Faizabad refused permission to Hindus to construct a temple on the chabutara (platform) just outside on the left of the gate following the objections raised by Muslims. In 1885 Mahant Raghubar Das filed a suit with the Sub-judge at Faizabad for permission to build the temple and in March 1886, the Sub-judge turned down permission to construct a temple and appeals were dismissed. Tensions mounted and Muslim shaheeds (martyrs) gathered in the fortified Babri Masjid and the Hindu counterparts thronged at the nearby Hanuman Garhi. Following a battle, Hindus took the Babri Masjid leaving some seventy-five Muslims dead.Claims have been made that worship took place on a platform called "Ram Chabutara" prior to Independence. According to British sources, Hindus and Muslims used to worship together in the Disputed Structure in the 19th century until about 1855. It is only in the nineteenth century the temple-demolition/mosque-construction story gets recorded. In 1822 Hafizullah, an official of the Faizabad law-court claimed that "[t]he mosque founded by emperor Babur is situated at the birth-place of Ram" and then the story gets into the records such as P. Carnegy's historical sketch of Faizabad (1870), H. R. Nevill's Faizabad District Gazetteer, and as a footnote of Mrs. A. S. Beveridge's English translation of Babur's Memoirs (1922). The British often referred to the mosque in their files as the 'Janmasthan Mosque of Ajoodhia' and put up a notice board in front of the iron railings calling the monument, wiwad grast (disputed). When the mosque was under the control of the Muslims through the 1920s and 1930s, it was mismanaged and neglected, and the Waqf (Muslim endowment board) Commissioner of Faizabad condemned the muttwalii as an opium addict in a report signed September 16, 1938. The installation of idols inside the mosque on the night of December 22, 1949 led to the attachment and closure of the building for both Muslims and Hindus by an administrative order. Contrary to the 'Ram's miraculous appearance' theory, the First Investigation Report of the Station Officer of the Ayodhya police station dated December 23, 1949 stated that three individuals (Abdy Ram Das, Ram Shukla Das, Sudarshan Das) and some 50 to 60 people had "desecrated (napak kiya hai) the mosque by tresspassing (sic) the mosque through rioting and placing idol in it. Officers-on-duty and many other people have seen it." Later some 5 to 6 thousand people tried to enter the mosque raising religious slogans and kirtans but were stopped. A civil suit was filed on January 16, 1950 by an individual, Gopal Singh Visharad, for a declaration of the right to worship. The judge restrained the removal of the idols and ordered no interference with the puja (worship). The state of Uttar Pradesh filed an appeal against the injunction on April 24, 1950. According to historian Sushil Srivastava, "from 1951 to 1986, things remained relatively quiet in Faizabad." Just like the lull between 1886 and 1950 without any street or court battles, the period between 1951 and 1986 passed without any major incidents. Important development was that due to their exemplery service to nation in Indo-Chinese war of 1962 RSS lent exemplery support to Indian Army. In the Republic Day parade of next year the RSS was allowed to participate with full honours as a separate contingent.But the acute anti-communism of the RSS, pushed it into a opposition in the post 1971 phase when New Delhi was leaning almost exclusively toward Moscow. The process culminated in the RSS taking a very active role in the movement against Indira Gandhi government during emergency and facing a ban once again when the emergency was declared. "The newly formed political party backed by hindu oraganisations tried to fill this gap and bank on this resentment to give rise to concept of "Hindu Nationalism" where nation is to be protected from successionism nad also the hindu charater has to be maintained at the same time as it was threatened by converions. So according to me Meenakshipuram, Sanjay`s Elimination, Sikh fundamentalism have united Hindus but they are not politically consolidated, which they did after SriRamrath yatra for Shri Ramjanabhoomi Temple". In October 1984 the VHP tried to make the mosque-temple question a national issue through its Sri Rama Janma Bhoomi Mukti Yajna Samiti. It was formed on July 27, 1984 with the sole aim of liberating the disputed site. A 130-kilometer-long march was started on October 8, 1984 from Ayodhya to Lucknow, the state capital. The yatra (march) participants reached Lucknow on October 14, organized a public meeting, and called on the Chief Minister "to fulfil the long outstanding demand of the Hindus." The next day 'Sri Rama Janaki Ratha' (Ram-Sita chariot) began to tour the major Uttar Pradesh towns so as to mobilize public opinion and to administer 'Janmasthan Mukti Pledge' to the public. Although the 'Ratha' reached Delhi on October 31 in order to join the 'Hindu Convention' on November 2, Mrs. Indira Gandhi's assassination forced the cancellation of the program. As the Shah Bano controversy was raging across India late 1985, the District and Sessions Judge of Faizabad, K. M. Pandey, ordered to open the locks of the mosque and indirectly allowed the priests to enter. The padlocks were removed by the order of a district judge on February 1, 1986. After giving in to Muslim fundamentalism on the ShahBano case, the Rajiv Gandhi government was keen on playing the 'Hindu card' for presumed electoral gains. N. Ram contends that the assurances given to the Hindu communalists before the court decision and the failure to appeal against the order revealed the collusive hand of Rajiv's government. (23) An explosive situation emerged almost all over the country with Muslims protesting, and VHP elements celebrating and criticizing "Muslim objection to the judicial order on the Babri Masjid." Rajiv's Minister for Wakf, Rajindra Kumari Bajpai, advised Muslims "to take recourse to law and not to create disturbance. The most critical stage of the conflict was the build-up to the 1989 elections which witnessed the preparation and mobilization to demolish the mosque and build a Ram temple with consecrated bricks brought from all over India and other countries. As N. Ram points out, just a few days before the 1989 general elections, the desperate Rajiv Gandhi regime allowed the VHP to perform shilanyas (laying foundation stone) for the Ram temple on November 9, 1989 on disputed land which was temporarily declared to be undisputed. This action boosted the VHP-BJP-RSS combine to advance its Ramjanmabhumi campaign through changes of regime.The November 22-24, 1989 general elections witnessed the worst ever communal violence in the independent India's electoral history and took a massive toll of 800 lives in the Hindi belt. V. P. Singh became the Prime Minister with the support of the BJP who had 88 seats in the new Parliament. The V. P. Singh regime ushered in the judicial process by establishing a Special Bench on January 8, 1990 and pleading for a ban on construction till the title to the disputed site could be decided and the site-plan approved. The Special Court called upon the UP government to clarify the status of the site. A Hindu priest filed a writ petition seeking relief to permit construction of the temple on the spot of shilanyas performed on November 9, 1989. Having been directed to file a counter-affidavit by the Lucknow bench of the Allahabad High Court, the central government maintained that no construction could be allowed unless all the civil suits pending before the special bench of the High Court were decided. In the meantime, on January 12, 1990, the Supreme Court allowed the 'Hindu' representatives to raise as a preliminary issue before the full bench of the Lucknow High Court that the suit by the Sunni Waqf on behalf of Muslims was not maintainable The bench, however, decided it would not interfere with the October 23, 1989 order of the Lucknow bench before taking evidence for the trial of all the five suits which were from 28 to 39 years old in their pendency in the District Court. The VHP appealed before the Supreme Court that the Sunni Waqf suit filed on December 18, 1961 be dismissed on the grounds they cited. Meanwhile, the AIBMAC (All India Babri Masjid Action Committee) revived its earlier demand in its December 25, 1989 meeting that if a negotiated settlement failed, the dispute should be decided by high court judges "of some South Indian State, none of whom should be either Hindu or Muslim." The RSS mouthpiece Organiser of January 14, 1990 took exception of this revived claim and V. P. Singh's meeting with Muslim leaders, and claimed that it "was not a case about the title of a place but of undoing a historical wrong and for that matter no court could decide it." They would rather follow the guidance of the Dharmacharya Sammelan (gathering of religious heads) to be held on January 27-28, 1990 at Allahabad. The 'auspicious' February 14 was chosen to begin temple construction which V. P. Singh managed to change with great difficulty by pointing out the grave situation in Kashmir and Punjab. As the Hindu groups' June 8 deadline passed without government's settlement plan, the VHP meeting in Haridwar decided to begin construction from October 30. At this backdrop, V. P. Singh introduced the Reservation Bill in the Lok Sabha on August 7, 1990 and 'upper caste' Hindus rose up in revolt. With brahmin youths self-immolating in northern India, Advani set out in September on his 10,000 kilometers 'rathyatra' (chariot procession) toconverge on Ayodhya for construction and to force the government to hand over the site to the Hindutva forces. When Advani and his cohorts were arrested in Bihar on October 23, the BJP withdrew its support to government and V. P. Singh ministry fell on November 9. Chandra Shekhar, who was in power from November 1990 to early March 1991, made a breakthrough of bringing both the VHP and the AIBMAC to the negotiation table. They met first on December 1, 1990, presented the 'evidence' of their sides to the Indian government on December 23, obtained copies of the 'evidence' of the other side from the government, and met again on January 10, 1991. In that meeting they decided to set up four committees of experts nominated by both parties to examine the historical and archaeological evidence and revenue and legal records collected as evidence. The VHP released the summary of 'evidence' to the public, turned down the demand of the other side for more time to study and evaluate the evidence. The ultimate stage of the conflict was Narasimha Rao government's inaction even after the virtual announcement of the Hindus their demolition plan in late October 1992. As N. Ram puts it: If there is one 'theory' that this devotee of drift has contributed to national political life, it is the non-secular rule of not opposing 'Hindu religious sentiment' under any circumstances and of avoiding 'confrontation' with the saffron gentry and their lay allies.According to Raos statement on Ayodhya, which he was not allowed to make in Parliament, about 70,000 kar sevaks (volunteers) had assembled at the Ram Katha Kunj for the public meeting and 500 sadhus and sants (religious figures) at the foundation terrace for the pooja. Between 11:45 and 11:50 a.m. some 150 kar sevaks managed to break the cordon on the terrace and pelted stones at the police. About 1,000 kar sevaks broke into the Babri structure and some 80 of them managed to climb on the domes of the building and started demolishing them. In the meantime, they had damaged the outer boundary wall. At around 12:20 p.m. about 25,000 kar sevaks had gathered in the complex and by 2:40 p.m. a crowd of 75,000 was surrounding the structure of whom many were engaged in demolition. The makeshift temple is now there replacing babri complex. Hindus want to build a grand temple but the matter is under court investigation but this does not seem to deter the Hindus in preparing for its grand construction and some models and basic stone work has already been completed channelled by different organisations including the Vishwa Hindu Parishad . Various workshops in different parts of India are working continuously since Sept. 1990. Till 2001, about 45% of the work on Ground Floor was completed. The Britishers had consolidated their hold and dominations in Bengal and Bihar before the advent of the l9th century and Awadh was their next target.The Britishers were facing strong resistance from the Hindus and the Muslims in their campaign to occupy Awadh. The freedom fighters were led by Moulvi Ahmedullah, Raja Debi Baksh Singh, Amil Ali and the revolutionary Ram Charan Das. In pursuance of their policy of 'Divide and Rule,' the British invented stories and fabricated history to sow seeds of hatred and enmity between the Hindus and Muslims. The Britishers systematically planted false stories against the Muslim and particularly against the mogul rulers as they were trying to usurp the rule from them. The Britishers, as a part of plan to annex Awadh, planted false stories of demolition of Hindu temples by the Muslim rulers and of Ram's birth place temple by Babar to create enmity and hatred between Hindus and the Muslims. Their aim was to gain sympathies of the Hindus for their campaign against the Moguls and to weaken the resistance of Hindus and Muslims opposing the British occupationist moves. They succeeded in creating a divide between the two communities at Ayodhya which resulted in the Hindu clash over Babri Masjid in 1855. It was the first ever encounter between them for this place of worship.It is not a mere coincidence that after the clash of 1855, the Britishers occupied Awadh in 1856 and in 1857 they captured Delhi in spite of the struggle by valiant freedom fighters. The clash over Babri Masjid paved way for the British occupation of India. "We (i.e. the British) had been deeply worried by the decision (i.e. settlement of dispute between Hindus and Muslims)....we had apprehended that the British Raj (rule) in India will come to an end...."
In spite of the conspiracy to create ill-will enmity between the two communities, the British faced strong resistance in which the Muslims fought under Hindu rulers and leaders and Hindus fought under Muslim rulers and leaders in the campaign of l857.The Britishers, therefore, persued their policy of 'divide and rule' more vigorously and kept on circulating false stories particularly against the Mogul rulers. It was during this period that H.R. Nevill wrote in the District Gazetteer of Faizabad that in 1528 Babar halted at Ayodhya for a week and destroyed the temple and built the masjid on its site. Nevill did not cite any reference. After all no Englishman, neither Nevill nor were Cunningham, Carnegie, Fuhrer and writers of this kind, present when the Muslim kings or the Moguls rule over this country. As historical and archaeological 'evidences' fail to tell us anything concrete or something even remotely convincing, so do the voices of faith.The movement for Ramjanambhoomi temple brought this place is once agian becomes of centre of national attraction,however this dispute is still in courts. however civil society nad religious leaders are involved in serious dislogue over the issue. In the year 2003,the Shankaracharya of Kanchi Kamakoti Peetham, Sri Jayendra Saraswati started negotiations with the All India Muslim Personal Law Board over the Ram Janambhoomi-Babri Masjid site in Ayodhya, have run into rough water who on his own tried to convince Muslims to find a solution. What is the extent of your, your Mutt's involvement in Ayodhya? Is it only the temple? In Ayodhya the Kanchi Mutt has set up a trust, the Kanchi Ayodhya Nagara Development Trust. On it we have our Mutt officials, and locals, including a Muslim. The people of that area, whether Hindu or Muslim, are very poor; the mahants and such people are also there, living in big bungalows, they are happy. So we thought of doing something for the people, to do some social service, for the poor to prosper. We teach them tailoring, and buy readymade clothes from them which is sold in Hyderabad, so they have a steady livelihood. We have also started embroidery classes recently, and both Hindus and Muslims are part of this project. That is one endeavour of ours that is on in Ayodhya. Apart from that we have also set up a small information technology project in Ayodhya, in which both Hindus and Muslims, men and women, participate. We have taken on rent a small place there, hired two teachers to teach them IT, and help them set up on their own by giving them whatever help they may need. One batch is over and the second batch commenced on the 6th of this month. We want to see the people of Ayodhya happy. There is no point in fighting over Ram, Krishna, this god or that, in Ayodhya. Feed the stomach, Swamigal, they say. They are now able to look after themselves, their family, with dignity. Both communities are living with dignity, which is important. But what about the main problem in Ayodhya? As far as Ayodhya is concerned there is no problem at all. Not through the Mutts there, or through the poor people. If any problem is there it is coming through outside forces. If these forces were to keep away the problem you are referring to will automatically solve itself. I am talking about the specific problem over the Ram temple. You and the All India Muslim Personal Law Board had this exchange of letters, which raised a lot of hope all around, and then came your letter dated July 1, in which you raised Kashi and Mathura over which the Board expressed its dismay. Why? Leave their feelings alone. OK, I agree, maybe I need not have mentioned Kashi and Mathura, I don't want them either, but what about the other points in my letter? They have used this as a pretext to ignore the other points mentioned by me. We had said, in the first letter, to give us the undisputed area, and to build a wall in the middle if they feel that we will extend the temple, if they don't trust us. We will in the meantime talk, look to the court judgment etc. No one else should interfere in this matter, it should be sorted out by the two sides. Then they asked for some clarifications. You had mentioned the court judgment, they said, so can you tell us where the Ramalayam's garba griha will be located? Show the same on the map, they said. We wrote to them that the undisputed and disputed areas, which were separate earlier, have become one, is not in existence anymore. They were separate, which is why we had asked for it, but now there is no separation of disputed and undisputed areas. In the last developments of the last few months the two parts have become one. What are these developments you referred to? The matter went to the Supreme Court for vacating the stay on the undisputed land given during the Bhoomi Pujan, which ruled that the stay will be vacated only when the status of the disputed land is sorted out. After that there is no point talking about disputed and undisputed areas, they have become one. There is no sense in them saying they won't give the undisputed area, both are now disputed. Given that, if we want the talks to go anywhere, we have to start discussing the disputed area since the court has made even the undisputed area into a disputed one. On what basis did you ask for the disputed land? We gave them reasons for saying so. One, for the sake of communal harmony. This issue has led to a lot of violence, and will lead to more violence in which poor people will get killed. You must develop a spirit of give-and-take. It is the vishwas-bhoomi [land of faith] for Hindus. For you, it is of a man who you call great today [Babar], we don't know what he was then. We don't also know if there was a temple there. Hindus have the faith that he was born there, so keeping in mind this faith if you give up the area it will lead to communal harmony, we told them. Two, today, Lord Ram is already seated there, although in a small jhopdi, it is the reality. As of today if you think anyone can move him from there, it is impossible. Just as the undisputed and disputed areas have become one, it is also evident that Lord Ram has occupied the site. If he is moved, there will be mass protests, so he cannot be moved. Even a human being, over twelve years, acquires property, family etc. Also, whether occupied land or unoccupied, if someone has resided in a place for twelve years the law recognizes him as the owner. But we told them, we are not here to claim ownership. It may be yours but we are asking you to give it up in our favour. We can also go the law's way but we are asking you. Next, there are already many mosques in that town, some 20. But only eight have prayers offered there still, the others are in a state of disrepair. No one's come forward to repair them, nor has the government given permission for it. In this situation if you erect another mosque who do you expect to come and pray there? You build a temple or mosque when there are people around. Like, when you build a colony you build a Vinayak temple. But you don't erect a temple just because the land is yours, you build where there is scope for public worship. Similarly there is no need for public worship in a mosque there, where will the people come from? For this reason also you must give in to us, we said. More, we all accept Allah as great, the supreme power. We pray to such a god, in a mosque worthy of him, or in a holy place, or even when you find the time and place. But here is a mosque named after Babar, who came here, fought and won, so you decide, is he of importance, or is Allah of importance? Allah is supreme, but do we rate Babar who came here and fought as equally important? This fact of his war, whenever it was fought in history, will be remembered forever. If you want the ill will to go, remove Babar. Otherwise, his memory will keep coming up, and the problem will keep recurring. we all agree that communal harmony is needed. The Wakf Board has given up so much land in so many places, for schools, colleges, etc. It is nothing new. Given that, if you give up this site for the sake of communal harmony, you will come to occupy an exalted position. Because, although only a handful of Muslims may be terrorists they have given the entire community a bad name. Because of them the general perception is that a Muslim is someone who will only fight. But, if you were to think in a spirit of accommodation, you will enhance the reputation of Indian Muslims across the world, as a people who are willing to give in for communal harmony. Which led to the Board digging its heels in. But why Kashi and Mathura? That was extra, yes. I don't need it, it is not needed now, but I said one day Hindus may ask for them so be prepared mentally for it, that's all. But it was unnecessary, yes, though we had said it. But it is that which apparently created all the problems. You are wrong, that did not create any problems at all. I have a copy of their resolution, and do you know, there is not a word in it about that point. They have not said anything about it. On the contrary, they have mentioned there is a difference between my first and second letters. Yes, there seems to be a hint of a threat in your second letter. What threat? Isn't there a difference between saying 'prepare yourself mentally' and 'get ready to fight'? If your office says your performance is not good, is that a threat? It means to change your behaviour, to perform better, and cannot be considered a threat, but sound advice. If someone mistakes advice for a threat, what can I do! The two are different. When you say, 'if you don't do this I will kill you, harm you' that is a threat, but we are not doing it. To consider well-meaning advice as a threat is the wrong approach. Anyway, let it be, we have no such desire in our minds. In all fairness, their reply should have been to question why I am asking for the disputed area instead of the undisputed area. But they never wanted to know! If they had asked me I would have told them that the two have become one now, both are a problem today. Since the whole land has now become disputed, where do we start from if not the disputed area so that the non-disputed area also comes out? This has to be faced, but no one wants to face it. So what is the next stage in the negotiations? Unless they are willing to face all this we will not talk about the next phase. But what do you expect to see from them? The news must come out, that they realize we changed our view was that since the disputed and non-disputed have become one, we broached the disputed land. This has to happen. Second, they have announced that no one has the right to give away Allah's land. Even during the various Muslim empires they have given grants to various temples and Mutts, including land. Grants were given to the Sringeri Mutt, our [Kanchi] Mutt, to the Srirangam temple and many others. One of them even built a temple! That proves there's nothing that says Allah's property cannot be given away. Apart from what the Wakf Board owns everything else belongs to Allah. If the world is Allah's property how can they be different with just one piece of land? They have not answered that properly. They had clarifications of my first letter, but no doubts over the second letter. Why? So how did they decide Allah's property cannot be given, how did they decide that we are threatening them? Did I ask anything for myself? Since I mentioned Kashi and Mathura they should have wanted to know what will happen later, who will ask, when, how, shall we talk about it now. Instead of that they decide that Allah's property cannot be given away, so how do they want to solve the problem? The way we say everything is Bhagwan's they believe Allah's property is all over, fine, but how can they say they cannot give only that portion? What, they don't buy and sell shops and houses? Whose property is that, Allah's or theirs? According to the Quran, the world belongs to Allah, not one bit of land here or there. In countries like Pakistan mosques have been razed, only recently one was pulled down, but did you see any protest over it? In Afghanistan and Iraq many were ruined in the war. Such questions should be debated upon and done with. Instead, they say it is Allah's property and get stuck on one point: you raised Kashi and Mathura which we don't like. Finally they say looking at their image, honour, respect, dignity, their consensus, the consensus of all Indians they will consider [my proposal]. They have taken a minority status, and now talk about Indian consensus? Let them then give up the minority status. The counterpoint to what you say is, why can't Hindus show their large heart, the oft-repeated line that all faiths are equal, by giving away the site to Muslims? Why are you stuck on it? Yes, Hindus have a large heart, all faiths are equal. If it were not, such a senior religious leader like the Shankaracharya will not be talking to them. I have gone to Lucknow to talk to them, no saint has done that, no Hindu has gone there. Why did I go to Lucknow when they called me? For peace and communal harmony. Did they show me similar respect? I did not go there to see their architecture and such stuff. We were discussing this problem, so I went to an Arabic school there to talk to them, putting my prestige aside so that something positive may come about. Communal harmony can come about if both are in agreement. Has Allah told them to fight all the time, don't they have a spirit of give and take? Where can they go apart from India? We all have to live together right here. Don't you agree Muslims harbour a sense of grievance over December 6, 1992, when the Babri Masjid was pulled down by Hindus? What has happened has happened. They may feel that way but how long will they grieve over December 6? Our temples have also been demolished, people killed. In Kashmir many temples were destroyed, our people are still being killed there. Shouldn't we also harbour similar feelings? Both sides should forget. In day to day life there will be many grievances, they should not be nursed. December 6 cannot last forever. How many people must be upset over Babar's mosque in that sacred site? You have been grieving for 10 years, many people have grouses going back hundreds of years. After all he defeated us and built that structure, didn't he? Both sides have grievances, and both sides should get over them, one can't live that way. 'Did Allah tell them to fight all the time? Archaeological excavations have been going on at the Babri Masjid site in Ayodhya, but indications so far are that a temple was not pulled down to build the mosque. Doesn't it puncture Hindu claims that Ram's temple was razed to erect the mosque? Listen, Lord Ram was born hundreds, thousands of years ago. In matters of faith you cannot consider such stuff as proof. To give you an example, if your father died after you were born who is to say you were born to your mother and no one else? Because people around say she is your mother you believe she is. Or your dad has gone away, and returns after 10 years. Your mother knows him but you don't. Yet you believe her when she tells you he is your father, don't you? Isn't that faith? To give you another example, you believe that you will get paid after working for 30 days -- isn't that also faith? Setting out to prove faith is an impossible task. Faith is faith, proof is proof. Can you prove there's god? That is faith. Can we prove Allah exists? That is faith? Can we prove Ram exists? That is faith. Because we believe in the Quran we believe in Allah; we believe in the Ramayan, so we believe in Ram. Faith is not to be tested and proved. My question remains. For long the case was built up that a Ram temple was demolished to build the mosque. Now it may so happen that it wasn't the case. The question is not whether a temple existed there or not. The question is of the site's sacredness. We have faith that he was born there. What gives us that faith? We could claim many other sites in Ayodhya, but why are we saying this is the site? Exactly. There are other such sites too in Ayodhya. Where? Nowhere The sites you are talking about are like 'the place where Ram played, Ram's kitchen, the place where he slept' etc. No other place claims to be the janambhoomi, our faith is this particular site is where he was born. Second, it was the custom to build a mosque on our holy sites. In that sense they seem to be the cause behind our faith (laughs). We know that they had built their mosques on sites important to us. They thus indirectly contributed to our faith growing. You had said there are enough mosques in Ayodhya, so there is no need for another. Conversely, isn't it true that there are enough temples in India and there is no need for another one? My earlier question remains. Are further talks possible? If one can abandon ego, not think of a prestige issue, and think instead of communal harmony, talks are possible. Otherwise, no chance. Will there ever be a solution to the Ayodhya problem? If it is solved, the country can prosper. Otherwise everyone will die. There will be violence, war, many people will be killed. It will be the poor who will suffer. The ones with brains will get away. What is your impression of AIMPLB President Maulana Rabey Hasan Nadvi, with who you have been interacting? You won't find another good human being like him. He is very spiritual (satvik) in nature. He is the nephew of Ali Miyan [Maulana Abul Hasan Ali Hasani Nadvi, a respected Muslim leader and rector of the Nadwatul Ulama], who had come here twice and thrice when Periyavar [the late Kanchi Parmacharya Chandrasekharendra Saraswati] was around. Nadvi is just like his uncle, and possesses all the qualities essential for a tapaswi. The others around him are different, poor fellow, what can he do by himself! There are many people like him among Muslims, they must come together and overcome the negative forces. Such people are not there among Muslims alone. They need to be overcome. The good people must stand up and do it, for the sake of communal harmony, nation, unity, for the good of everyone. There is no point being adamant on a point and calibrating your replies on that basis. If you want to, then better to do it face to face. Let's talk about it, and not through the media. But why have you been communicating through letters, why not face to face? They asked for a letter, we gave it. They said we need to place it before their committee, so we gave them the first letter. They had clarifications, we gave explanations. If they didn't ask why would we give? We had been talking all along. They could have formed a subcommittee, decided on a face to face, done that, and then asked for a letter. They could have done that also, but did not. Or, they could have said on receiving the second letter that some points have been raised, let us seek clarifications, talk face to face. If their intention was above board they would have done that. What about reports that the next round of negotiations have begun? The effort is always underway. My doors are always open. Just as their doors are open. Someone has to do the talking. Out of the five Sankara Matts (the other four being in Badrinath, Dwarka, Puri and Sringeri), you have taken the lead in trying to solve the problem. 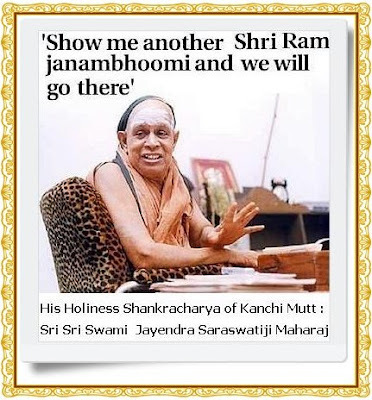 Are the other four Shankaracharyas with you in your initiative? No one has opposed it. No one has any objection. No one is concerned so long as something good comes out, doesn't matter whether it is a Shankaracharya or anyone else doing it. I am not doing it to hog the credit; if I did, the other Mutts could get upset. National integration, communal harmony, the country's well-being, and a Ram temple comes up, where is my name in it? If I had the ego to take credit for it, others could get angry and oppose me but that's not my intention at all. If everything goes well Ayodhya will benefit, the nation will benefit! How will I benefit personally? I will still be sitting here in Kanchipuram. I am merely doing my duty, so there is no way for anyone to become angry at me. Except, of course, the politician (laughs). There is also doubt over the status of the Kanchi Mutt itself. Adi Sankara, goes one belief, founded only four Mutts, and the Kanchi Mutt is self-proclaimed. Those who say so will say so. It is like the dog barking at the sun, does the sun care? If a cloud blocks the sun, has the sun disappeared? Similarly, such statements won't rob the Kanchi Mutt of anything. I know who is spreading such talk, he had in fact been a friend of mine once, he had then given in writing that Kanchi was also a Sankara Mutt (laughs). We still have that letter. Today there is not a squeak out of him, there is no publicity for him, the world today knows only one Shankaracharya, he is unable to handle this obscurity and gives vent to his feelings to the press. That's all. One thing has always puzzled people. What is your interest in Ayodhya? Why are you involved in the negotiations? Shouldn't I do at least one good thing in my lifetime? There is so much strife over Ayodhya. Do you know what the name means? A-yodham, meaning a place without war. Can there be another adarsh-purush [ideal] like him! If not a memorial for him then who else! 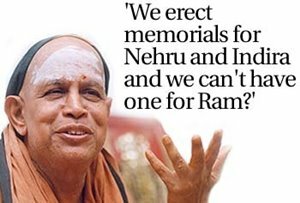 We erect memorials for our fathers, grandfathers, Nehru, Indira Gandhi and Kamaraj, and we can't have one for Ram? It has been facing problems for so many years. We are willing to do that for politicians, but not for god? But hasn't the issue been politicized? We are involved just so that it won't be politicized, to keep the politicians out. I have said they should not be involved, even [Prime Minister A B] Vajpayee has said it. Many people have the same opinion, but still politicians make hay. The latest is [former prime minister] Chandra Shekhar and [former minister] Ram Vilas Paswan have said I should not be involved. In fact, when Chandra Shekhar was prime minister he had brought a delegation that included Ali Miyan here for discussions, the Periyavar [the late senior Shankaracharya Chandrasekharendra Saraswati] was alive then, and I was also around. In this town, in this Mutt! He was the man who started the whole thing. But today he suddenly finds me political. Then he needed the Shankaracharya, today when he is out of power he has no need! Does such criticism hurt you? The Vishwa Hindu Parishad, for instance, said you, a Saivite guru, was interfering in the Ram temple issue. If I get hurt I can't be a Swamigal. Don't they know Ram was a Shiv-bhakt? He worshipped Shiva in Rameswaram after slaying Ravan, to remove the curse. They don't know this, and are saying these things. Let me go a step ahead. Many of those on the Ram Janambhoomi Nyas are from Ayodhya. There are members of the Ramnandiya group on the Trust, who are the only ones authorized to do Ram-puja. But they won't look at either Krishna or Narayan, aspects of the same god, such severe Vaishnavites they are. With such people on board how have they asked for Kashi and Mathura? I am asking this for argument's sake, of course. These people talk without knowing the facts well. How does the prime minister look at the breakdown in talks, would you know? Is he upset? He is not involved in this. He has kept himself aloof. If it moves forward, he helps. If it doesn't, he lets go. That's all.